William Arthur Blog: Enter Our “Love, Vera” Pinterest Contest! Enter Our “Love, Vera” Pinterest Contest! When it comes to choosing an invitation to herald your Big Day, we like to think our Vera Wang On Weddings album will delight the modern bride with a modern, sophisticated aesthetic. Inspired by the designer's bridal and ready-to-wear lines, it's a collection of invitations, save the dates and other accessory pieces that celebrate tactile embellishments that add charm and elegance. So, we teamed up with Style Me Pretty for our "Love, Vera" Pinterest contest. We created a Pinterest board inspired by it, and we’d love for you to do the same. Five lucky Pinners will receive five boxes each of our engraved, foil stamped bordered thank you notes in black, gold or pearl. * If you don’t have a Pinterest account, we can help! Email us at concierge@crane.com and we’ll send you an invite. By entering the “Love, Vera” Pinterest contest, the contestant grants Vera Wang Papers permission to promote the contestant’s name and submission for marketing purposes. Slight alterations may be made by staff in order to fit size restrictions on our digital marketing platforms. The contest ends at 11:59 p.m., EST on Tuesday, March 18th. Entries must be received before the end of the contest to be eligible. Any received after this date will be disqualified. Vera Wang Papers expects to select winners on or around Friday, March 21st. Winners will be informed via email and the prize will be release within two weeks of the announcement. If the winner does not respond within 48 hours of being contacted, a new winner will be chosen. The five winners will each receive one box of Vera Wang engraved, foil stamped bordered thank you notes in black, gold or pearl. 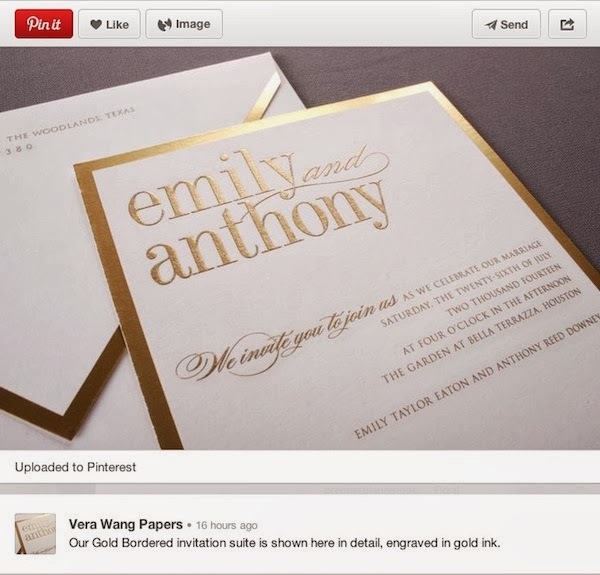 Vera Wang Papers reserves the right to substitute a prize of equal or greater value. The winner may not exchange the prize for cash or any other merchandise or service. The winner will be solely responsible for all applicable taxes related to accepting the prize. Contestants are granting Vera Wang Papers an irrevocable, royalty-free, worldwide right and license to use your entry in connection with the contest and feature your entry and all its content in connection with the contest in all media (now known or hereafter developed). Contestants agree to sign any necessary documentation that may be required for us and our designees to make use of the rights contestants grant above. Contestants will not receive any compensation or credit for use of their entry, other than as described in these terms and conditions. Vera Wang Papers is not responsible for any unauthorized use of contestants. By entry in this contest, each contestant is, to the extent allowed by law, releasing and holding harmless William Arthur and its subsidiaries, affiliates, employees and agents from any and all liability arising from or in connection with the contest or any prize won.